America’s Decadent Leadership Class Putin doesn’t respect them, and they don’t like half the American people. It is quite dreadful and a showing of the gravest disrespect that, if U.S. intelligence agencies are correct, Russia’s Vladimir Putin has inserted himself into America’s presidential election. And it could not have deeper implications. If Russia is indeed behind the leaks of the emails of Democratic Party operatives Mr. Putin may have many reasons, as he often does, but the most frightening would be that he views the current American political leadership class as utterly decadent and unworthy of traditional diplomatic norms and boundaries. And, thinks, therefore, it deserves what it gets. Why would he find them decadent—morally hollowed out, unserious? That is the terrible part: because he knows them. Think of how he’s experienced them the past few years. Readers of these pages know of the Uranium One deal in which a Canadian businessman got Bill Clinton to help him get control of uranium mining fields in Kazakhstan. The businessman soon gave $31 million to the Clinton Foundation, with a pledge of $100 million more. Uranium One acquired significant holdings in the U.S. A Russian company moved to buy it. The deal needed U.S. approval, including from Secretary of State Hillary Clinton. While it was under consideration the Clinton Foundation received more money from Uranium One. Bill Clinton got a $500,000 speech fee. Mrs. Clinton approved the deal. The Russian company is now one of the world’s largest uranium producers. Significant amounts of U.S. uranium are, in effect, owned by Russia. This summer a WikiLeaks dump showed the State Department warning that Russia was moving to control the global supply of nuclear fuel. The deal went through anyway, and the foundation flourished. Peter Schweizer, who broke the Uranium One story, reported in these pages how Mrs. Clinton also pushed for a U.S.-Russian technology initiative whose goals included “the development of ties between the Russian and American people.” Mrs Clinton looked for U.S. investors and found them. Of the 28 announced “key partners,” 60% had made financial commitments to the Clinton Foundation. Even Russian investors ponied up. 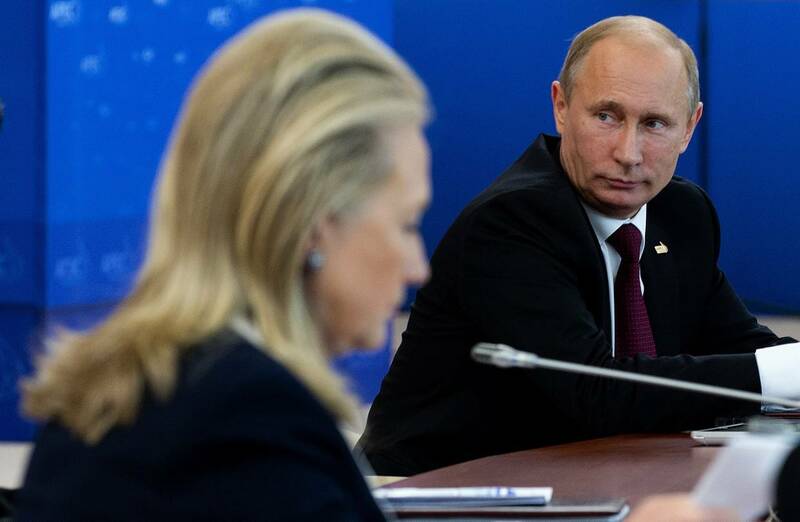 What would Mr. Putin, knowing all this and inferring Mrs. Clinton’s real priorities, conclude about the American political system and its major practitioners? Would he feel contempt? Might he toy with them? As for Donald Trump, we don’t know, because he has not released his tax returns, what ties if any he has with Russia. There are charges that Trump businesses are entangled with powerful Russian financiers. We know some of his top advisers had business ties to Russia or affiliated nations and leaders. Again, what might Mr. Putin think of this? Might he amuse himself with mischief, even to the point of attempting to hack the election returns? We’ll see. But nothing is more dangerous than this: that Mr. Putin and perhaps other world leaders have come to have diminished respect for the morality, patriotism and large-mindedness of our leaders. Nikita Khrushchev had a rough respect for JFK and his men and that respect, in the Cuban Missile Crisis, helped avert nuclear war. Mikhail Gorbachev was in the end half-awed by Ronald Reagan’s goodness and idealism; the world knew George H.W. Bush and respected his integrity, and so he was able to build coalitions that were real coalitions, not just names. Now, whoever wins, we are in a different place, a lesser and more dangerous one. On the latest groping charges: We cannot know for certain what is true, but my experience in such matters is that when a woman makes such a charge she is telling the truth. In a lifetime of fairly wide acquaintance, I’ve not known a woman to lie about sexual misbehavior or assault. I believe Juanita Broaddrick and Kathleen Willey, and I believe the women making the charges against Mr. Trump in the New York Times. The mainstream media of the United States is in the tank for the Democratic nominee, to its great and destructive shame: They add further ruin to the half-ruined reputation of a great American institution. That will make the country’s future harder and more torn up. But this story, at least as to the testimony of its central figures, does not appear to be an example of that. Here I would like to say a word for the spectacular illusions under which American voters once were able to operate. You used to be able to like your guy—to admire your candidate and imagine unknown virtues he no doubt possessed that would be revealed in time, in books. Those illusions were beautiful. They gave clean energy to the engine of our politics. You can’t have illusions anymore. That souring, which is based on knowledge and observation as opposed to mere cynicism, is painful to witness and bear. The other day a conservative intellectual declared to her fellow writers and thinkers: “I’m for the venal idiot who won’t mechanize government against all I hold dear.” That’s some bumper sticker, isn’t it? And who has illusions about Mrs. Clinton? No one. The big fact of the week, however, has to do with these words: They don’t like us. The Democrats, progressives and left-liberals who have been embarrassed by the latest WikiLeaks dump really hate conservatives, or nonleftists. They don’t like half the people of the country they seek to control! They look at that half with disdain and disrespect. Their disdain is not new—“bitter clingers,” “basket of deplorables.” But here it’s so unashamed and eager to express itself. Here’s what you see in the emails: the writers are the worst kind of snobs, snobs with nothing to recommend them. In their expression and thoughts they are common, banal, dumb, uninformed, parochial. I don’t know about you but when people look down on me I want them to be distinguished or outstanding in some way—towering minds, people of exquisite sensibility or learning. Not these grubbly poseurs, these people who’ve never had a thought but only a sensation: Christians are backward, I saw it in a movie! It’s the big fact of American life now, isn’t it? That we are patronized by our inferiors.